Summary: A curious thing has happened in health care pricing in this country. While insurance premiums and insured people’s prices for common procedures consistently go up and up and up, cash prices for many common, “shoppable” procedures vary little from year to year. We first started to notice this pattern when we were replicating our price reporting in cities where we had already collected cash prices, and then began comparing the two data sets year over year. As far as we know, we’re the only people who are collecting cash prices in this fashion, as journalists, so this is not information you will find elsewhere. In re-reporting our Texas women’s health prices, we noticed the prices in 2015 and 2016 were pretty similar. Our California re-reporting revealed very similar trends. And a recent re-reporting of New York area prices showed the same pattern. If you look at these cash prices for women’s health from Austin, Tex., for example, you can see the 2015 prices compared to the 2016 ones. (If the price listed is “$0,” that means they would not give us a price over the phone.) There are some increases, mostly modest, and some decreases. Some prices stay flat. I’ve written about this before, here. How do we do this work? We call providers and ask their cash or self-pay price. We have a system and a methodology that we’ve been using for about five years now. We explain that we’re not patients — we’re from an independent health care research organization. The original task we set ourselves was to find out what stuff costs. In doing that, we learned how to ask, who to ask and what to ask. We also learned to re-survey prices, to make sure we’re up to date. And in the course of doing this work, we noticed this strange thing: For some providers, cash prices go up a lot. But for many providers, the cash price stays level or varies only by a small bit. It’s not rare to see the cash prices actually go down. To be sure, the data is not perfect. Many providers we surveyed in one year had, by the next year, merged or closed. Some providers did indeed raise rates consistently – and they tended to be the higher-priced providers in the first place. Also, we don’t have cash pricing data for every procedure and every provider in every city – that data does not exist – but we have a very good set of data, now for 13 metro areas, and the pattern is pretty clear. We recently re-reported our New York City cash prices. The picture was very much the same for a range of procedures. This shows the trend in New York MRI and ultrasound prices. Of course, this small data set of modestly priced items does not necessarily predict the same thing will happen with other procedures. The biggest spending in health care is not in an ultrasound or an MRI, of course. And yet we have learned that by focusing carefully on these small-ticket items, we can learn a lot about health care pricing in general. These wild variations in pricing — and the presence of many providers who don’t raise prices willy-nilly — persist across cities, across procedures, across providers, for the modest set of procedures that we research. But don’t all health care prices always go up? We’re all familiar with the charts and graphs showing the rise in health costs. Here’s one. 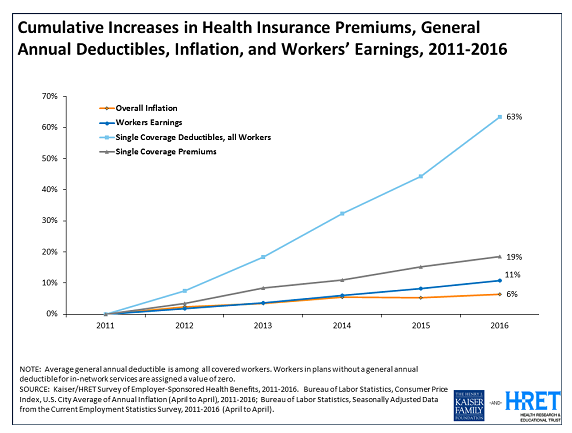 Premiums go up, deductibles go up, out-of-pocket spending goes up. Inexorably, inevitably. But if you look at the picture from another direction, those costs are wildly unpredictable. Here’s a sample of comparative prices given to us by Sutter Maternity and Surgery Center of Santa Cruz for Peninsula Coastal Region. Sutter sent a spreadsheet with charged rates, reimbursement rates, and patient responsibility for a selected group of procedures at the hospital (see below). It’s an acute care hospital with 22 beds, said our contact there, Meggie Rhodeos, the business services manager, who said she was sending us the data at the request of the CEO, Stephen Gray. 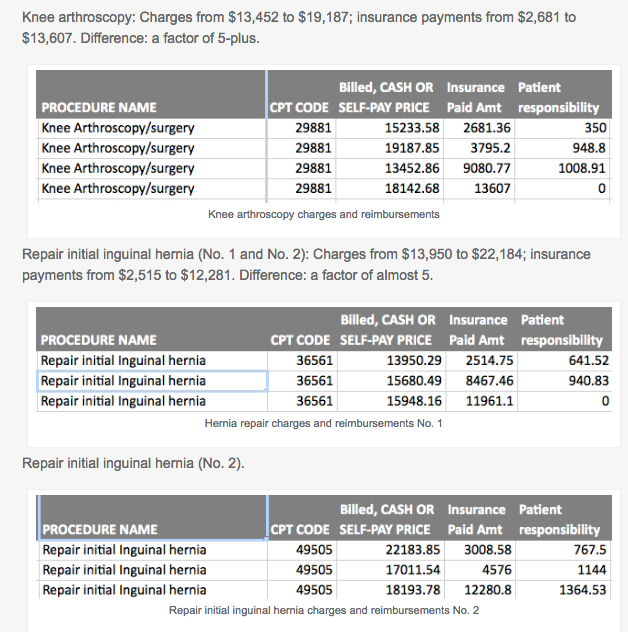 Knee arthroscopy: Charges from $13,452 to $19,187; insurance payments from $2,681 to $13,607. Difference: a factor of 5-plus. Repair initial inguinal hernia (No. 1 and No. 2): Charges from $13,950 to $22,184; insurance payments from $2,515 to $12,281. Difference: a factor of almost 5. Carpal tunnel surgery: Charges from $9,694 to $11,721; payments from $1,953 to $7,079. Difference: A factor of 3.6. 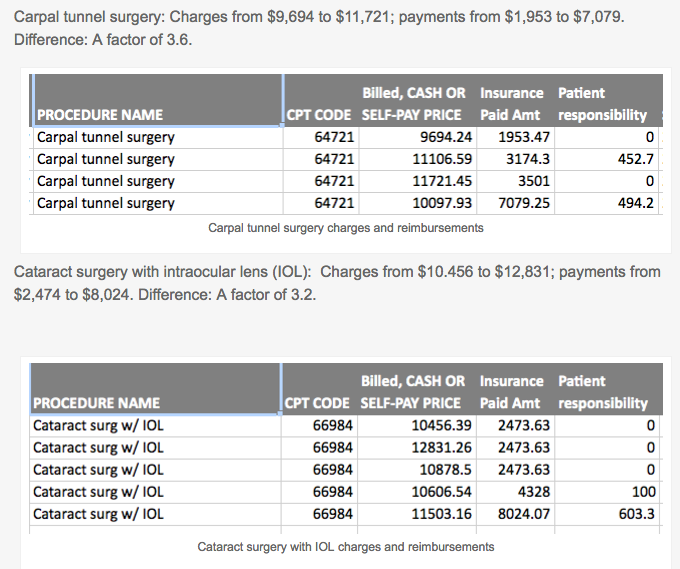 Cataract surgery with intraocular lens (IOL): Charges from $10.456 to $12,831; payments from $2,474 to $8,024. Difference: A factor of 3.2. Each one submitted is for a different patient with different insurances, she explained in an email. They wanted to be sure they gave the full range, she added. I’ve written about this in more detail here. So if you have a $10,000 deductible, for example, you might exhaust that deductible before you get to anything else, depending on the “insurance paid” or “negotiated” rate. Or, you might spend only $2,681 of your deductible. At the Oklahoma Surgery Center, Dr. Keith Smith has been publicizing cash prices for nearly nine years. Paralleling what we learned in our cash price survey, he told us they don’t change that much. He said more and more providers are choosing to post cash prices publicly, a change from when he began this practice. “The more people there are who list their prices, the more likely it is that a situation will arise where the patient walks into one facility or a physician’s office and insists that they step up and match a price that they found — or they’re going to have to travel to Oklahoma City or wherever and get their surgery,” he said. So what causes insurance premiums and other prices to continue going up? Contracts between providers (doctors, hospitals) and payers (insurance companies) can include things like automatic escalator clauses. These are stipulations that an automatic raise takes place in the payment rate to the hospital from year to year. We have heard that these clauses cause hardship for employers when they’re left holding the responsibility to pay extra — as my acquaintance Bill Rusteberg describes in this interview about escalator clauses, and a school system that had to dip into reserves to the tune of $6 million because, he believes, of an escalator clause. It’s often hard to imagine how many parties there are behind the scenes, between you and your doctor, taking a dime or a dollar or a hundred dollars out of every transaction. For example, that hospital probably has many vice-presidents for strategic planning, and armies of business-office workers, and pricing consultants and people to make revenue-cycle management projections — just as the insurance company has vice-presidents for strategic planning, armies of workers and pricing consultants and people making revenue-cycle projections. In San Francisco, for example, our reporting shows that an MRI of the lower back, CPT code 72148, can be had for $475 cash at Castro Valley Open MRI. A member of the community said that by asking for a cash price for that same MRI as an insured person, he knocked a $1,850 bill down to $580. And another insured person was charged $5,667; insurance paid $2,367, and the patient was asked to pay $1,114.54, meaning the provider reaped $3,471.54. It’s hard to believe, but this data doesn’t lie. Here’s another data point: A friend is married to a hospital administrator whose hospital was struggling. He recently doubled his income, she told me. How? He renegotiated rates with the insurance company. How can this be? Doesn’t the insurance company always want to pay less? Well, that’s what insurance execs will tell you. If you’re an insurer paying more, then you’ll need to bump up your rates. When you as an insurer pay more, in other words, the money comes not out of the insurance company’s pocket, but out of the pocket of the employer, who pays for the plan, or the pocket of the insured person. Also, in truth there’s great value in paying more — that will easily convince people to pay more for insurance to avoid high bills. One former hospital exec told me that her organization consistently raised prices, every year. Do insurers care about prices? Maybe not. Smith is a cynic about the pricing system. “There’s a real misunderstanding that insurance companies care about prices,” he said. “They really don’t. All they care about are charges, because they’re they are in the business of selling discounts. One insurance company will compete with another insurance company because their discounts off of billed charges are better. And what what is not regularly discussed is the way in which these companies make money selling these discounts. “Many times a PPO for instance will inform an employer that because of our discount we saved you tens of thousands of dollars in per the terms of our contract. We share in that savings with you. “The higher the prices are to start with, the more money they make in discounting those prices. So that’s part of the problem. Smith also says government’s role in health care pricing has forced prices up. The end of the PPO system? Joining him in that cynicism is Mike Dendy, CEO of Advanced Medical Pricing Solutions, a Georgia-based company that does health cost management for self-funded employer insurance plans by scrutinizing bills, offering reference-based pricing services, as well as formation of narrower networks and direct contracting between providers and employers. Dendy predicts that the PPO concept will die over the next few years. In his business, he sees employer-sponsored plans paying extremely high prices via PPO plans. In his business, he helps beat back costs by reducing employer outlays using reference-based pricing, often based on the Medicare reimbursement rates. A common rule of thumb is paying 135 to 150 percent of Medicare’s rate, he said — while he has seen many providers reaping up to 700 percent of Medicare’s rate, or even much, much higher. “The last report I saw showed the average spending for an employee in America last year by an employer group was about $18,300 per employee,” he said. He further predicted that the insurance market will move toward defined contribution plans, where an employer’s outlay for an employee on health care would be limited in scope, rather than essentially unlimited. He compared employer travel policies with employer health policies. If you’re traveling for the company, he said, the company limits your outlay so you don’t stay at fancy hotels and eat steak and lobster — unless you’re paying for it yourself. But under current health insurance arrangements, via a PPO, an employee can choose an expensive MRI or an expensive hospital, and that raises everybody’s premiums. We’re looking for comment on this from insurers and providers — so if you have any thoughts, please let us know. We’ll plan a Part 2 of this piece related to that. We’ll continue reporting on this topic as well; an interesting bit of information swam up today when I was listening to a webinar on health pricing from the Phia Group, a Boston area legal firm that advises employers, third-party administrators, and others in the health care marketplace about pricing, contracts and so on. Adam Russo, head of Phia, said that he was surprised to know how much regional variation there was in things like reference-based pricing. When speaking to a group of brokers in Florida recently, he said, he asked the audience how many had heard of reference-based pricing, and 90 percent of them raised their hands. Asking the same question of a similar audience in Michigan, he said, 10 percent of the audience raised their hands. Meanwhile, there’s a growing body of research showing that people are interested in knowing prices, and that they will not choose the most expensive procedure. Here’s a recent post from Peter Ubel, a health economist at Duke University, talking about what happens when prices are disclosed. Of course, if you’ve met your deductible and you’re not price-sensitive, you may think about this differently. And, if it’s not a “shoppable” procedure — say, for example, an emergency appendectomy — then all bets are off.